This month I travelled to Finland for a conference on Culture, Values, and Justice. An interesting group of scholars attended who were exploring the many aspects, interrelationships, and applications of ideas that comprise these three areas. To me, these three subjects and their interrelationships suggest three questions that define the nature of being human. Who are we? What do we hold as important? How do we participate in our relationships in a way that upholds our humanness? These are not questions that are easy to discuss, whether in private or public forums. Yet they are questions that we need to consider in light of the challenges we face in the world. My conference presentation focused on understanding cross-cultural encounters as a gateway to transformative learning. The premise supporting this proposal is based partially of the work of Jack Mezirow who suggests that transformative learning is possible when we encounter a disorienting dilemma, something that causes us to examine and question our deeply held assumptions and thus consider alternative ways of thinking, acting, being. The question I explored is how we need to be present in these encounters in a way that supports transformative learning. There were some very interesting people in attendance at the conference from 14 different countries, thus the conference presented an opportunity for transformative learning. Unfortunately, the conference was designed as a typical academic conference with hours of paper presentations and very little time for discussion. What was missing was much opportunity to engage in cross-cultural dialogues about subjects that can make a difference in how we view and act in the world. In traveling through Scandinavia with a friend following the conference, I have had the opportunity to reflect on a few assumptions and raise some new questions. What kind of culture supports healthy relationships amongst people? What is the relationship between the structures that support human life and the quality of our life? How do we design, create, and maintain structures which support greater social and environmental sustainability? This was my first trip to Finland, Sweden, Norway and Denmark. One can’t help but notice the healthy natural environment, with very little air pollution, beautiful lakes and fjords, powerful waterfalls, crystal clear water, and bright green trees and grasses everywhere. Of course the winters support such an amazing natural environment, but so do the utility systems and transportation systems. Stockholm is a beautiful city with not a lot of traffic, likely because of a very well planned and well used public transportation system. 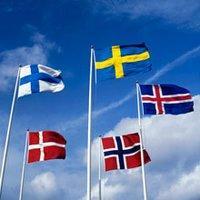 Sweden, compared to Finland and Norway, seemed to have a greater consciousness regarding environmental sustainability. Recycling is popular in Sweden and we were told that garbage now is burned and used for electricity rather than being sent to landfill. Electricity is the preferred heating even in such a cold climate. We also noticed the nature of human relationships being much gentler. Couples we met, especially in Sweden, seemed to treasure and honor each other. Children were treated gently and respectfully and they played together without aggression. And while there is quite a bit of individual freedom and much room for self-expression, there also are clearly established norms that seem to prevail to maintain a web of relationships. We wondered to what extent the social service systems, that provide a high degree of security, create less of a need for a competitive and thus more aggressive culture. Sweden did seem to benefit from a monoculture, although we heard some concern about increasing immigration from the Middle East. Our experience of Oslo, Norway was quite different from Stockholm. We had a difficult time getting a sense of interconnection in Oslo. Diverse cultures were quite present. The neighborhood where we stayed was primarily immigrants from Eastern Europe, the Middle East, and Africa. And while we heard that Oslo has a strong rule-bound culture, we were told that immigrants are not held to the same rules and standards as are Norwegians, thus making healthy assimilation difficult. The rationale for these differences seemed to be concern over being considered a racist country. Yet. Lack of some appropriate level of assimilation that protects values held important by the majority of people, puts a culture at risk of losing its identity. To a great extent we felt that Oslo didn’t have a clear sense of identity. Norway’s identity was a bit more present once we got outside of its largest city. The Norwegians seem to be people very proud of their independence and as such did not join the EU. What this trip sparked for me is a continued passion for understanding different cultures and ways of life. I am reminded of the importance of getting outside of our comfort zone and seeking to see and experience the world through a different lens. The questions this journey have raised for me are not meant to be answered, but rather to serve as guiding questions for continued reflection on what kind of world I want to live in and what action I can take to help support its creation. Every cross-cultural encounter creates an opportunity for transformative learning. We just need to show up in that encounter with curiosity, openness, and a desire to learn from the experience. We desperately need to learn from each, to share different perspectives and ways of being and working. In my opinion, this is the only way we will have the ability to address the complex challenges before us.